Instead of buying just 1 pair, now you can buy a 10 pack of Glo Glovs! You can save money by buying a 10 pack of Glo Glovs! Don't miss this awesome offer! 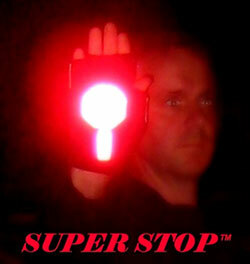 Glo Glov SuperStop Reflective Traffic Safety Gloves are designed for traffic directing and signaling professionals. Using a half-finger glove pattern, Glo Glov is made of the highest quality, breathable, non-fraying Nylon/Spandex. Custom shaped Reflexite retro-reflective vinyl, sewn on makes the glove stand out above the rest. Glo Glov is virtually weightless at 1.3 oz per pair! This ingenious safety product is one size only but stretches to fit over most standard gloves or they can be worn alone. With a red stop sign design in the palm and a yellow caution triangle on top traffic controller can communicate to motorists quickly and clearly day or night . EASY CARE: The gloves should be stored with palms together, kept away from extreme temperatures and stored dry. Hand wash with mild soap and air dried for best results. .